PARENTING! Which one do you think it is? An Art or a Science? But this particular workshop is not about only a parent and a child. Parenting essentially means taking care of another in the manner of a parent. This workshop will help us in applying the principles of parenting in any form of relationship. We will gain an understanding of applicable, practicable tools to play the role of a parent towards anyone, including ourselves. What is the role of a “parent” in any relationship? Does every relationship require parenting at all? How do I play the role of a parent in every area of my life? These and several other questions related to this universal concept of Parenting will be answered at the workshop. This workshop is for anyone and everyone. Whether you are a biological parent or a child or a student or a married person or single or an employer or a manager or a team member, you can explore and learn the principles of parenting and apply them in your every day life. Come, we will discover how to Parent others as well as how to Parent ourselves! We will learn to play the role of a PARENT to one and all! 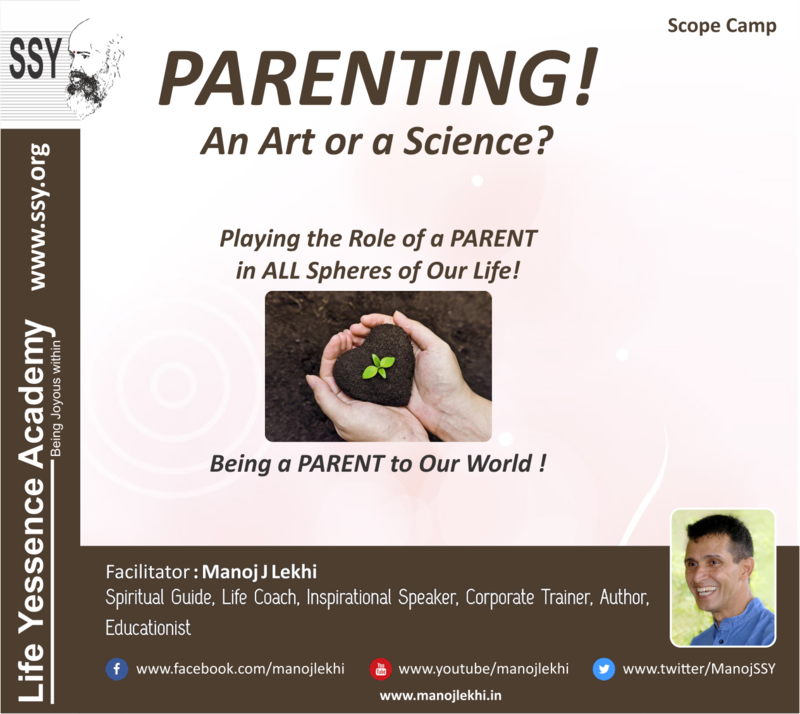 We will understand the Science of Parenting! We will master the Art of Parenting! Playing the Role of a PARENT in ALL Spheres of Our Life! Being a PARENT to Our World !